I usually ignore the conservative posts on this site. Very rarely visit, and never ever comment. I know there is no point to it. They have their minds made up and nothing I say will change it. 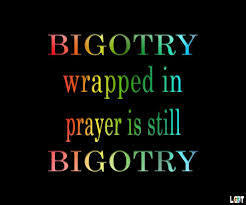 Nor will they ever convince me to their beliefs, so it is better if dialogue is kept to a minimum or totally avoided. All it results is in animony and consternation on both ends…..not worth it. Fortunately over time, MOST people have learned that denigrading one group in preference to another group is better known as bigotry. My mother would often tell stories about how southpaws (left-handed persons) were often forced to try to use their right hand. Even in my time growing up, there was some stigma associated with being left-handed, although it has dissapated somewhat. Now I hope MOST of us know that the hand one writes with has nothing to be with how smart the person is. Nor does the preferred hand decide who should get the promotion at work or make the big bucks. Eqaulity has been more of less established along those lines. But in so many others ways it has not been. When we talk equality, we are talking the same thing as “worth of every human”. Just because I was born in abject poverty doesn’t mean that I am intinctly less deservating of a decent life…and the livihood (money) that is required for that. The people who build the gadget, or design it, deserve respect also. 2. the workers are paid…as little as possible. 3. Blacks are only there to be play ball games and pick up trash. What the anti-equality people, like those on the worst of the bigot parade, The American Thinker are advocating is for that same paradigm to continue. While I suspect most of the writers even on that hideous rag would not suggest that left-handed people should be forced to write with their right hands (although they might who knows), they still reject the idea of equality. Why? Probably because equality goes in the fact of their perferred status quo which stands for the rich and powerful and against the poor…with minorities even more left out than the White poor. When groups have historically been left out, there has to be a counter-balance at some point. If Blacks or women have been historically denied job opporpunities, then efforts have to take place to make sure they now do. That the historically priveleged group may feel threatened is beside the point. People should, in fact be able to do what they are best able to do, and also get paid enough to sustain their quality of life. Just because a person cleans up the trash we leave behind in a restaurant, doesn’t mean that people should be paid barely enough to manage to put food on their own table, or to buy over-priced health insurance so they don’t premateurely die from something the rest of us are able to take care of almost immediately. There is no reason that those who play football should make millions while those cleaning the stands get pennies. Our system is wrong and creates hardship and in-equalithy for those not lucky. I myself, worked in an office, and worked hard. I did a good job for the company, I really did. But my values was not really considered. Meanwhile, the Walton family, with no real effort on their part, has billions because they were lucky enough to be born to it. How is that fair or proper? I am not demanding billions by any means. But I should not have to struggle as much as much as myself and many others have to while the Walton family sits in luxury. Let them have their luxury, but let me have a tiny slice of pie at least. Those that claim that equality is wrong, but that somehow accepting the values of all human beings are, in my considered opinion lying to themselves and us. What they REALLY mean is they like how things are. The situation where they have the power, or think they do…and the rest of us are left to suffer. In other words, one can’t be “anti-equality” without also denying many persons of human dignity. Some people refuse to get that human dignity requires equality of opportunity and value. I think people who dont believe all men are created equal are bigoted and feel they are above others but dont seem to feel beneath anyone either. Meaning to say, I am above you but I am not beneath anyone else. What arrogance and what bigotry. Humans are humans no matter what station in life, they are equal in humanity and being no matter where they live, how rich or poor they are, what their social status is, what religion, what race or color. We all bleed the same color, we all deserve dignity and respect as human beings. What separates us is not that we are more than or less than another, what separates us is how we treat our fellow human beings. I would not equate myself to a mass murderer or a terrorist for instance, but I am certainly no less of a person just because I am not as wealthy as another, or a different colour or race or creed. People who think or believe they are better than others should just shut up!! Amen, and society is wrong when it doesn't understand that truth, and try to make sure ALL have dignity...and are able to survive. Just because someone does the trash doesn't make them subhuman or unworthy of enough money to pay for their own food.